This book is widely used both as a textbook for college and university classes in police management and as a reference text for police managers in dealing with operational issues in their department, as well as for training police supervisors and administrators and is required reading for civil service promotional examinations. 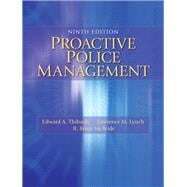 Proactive Police Management , 9e, is the widely used text for criminal justice and police science programs that emphasizes a contemporary and proactive approach to police management. Various police management styles are addressed throughout, from traditional scientific management to the behavioral/systems approach to the human relations approach. Its chapters take a realistic look at operational problems that can occur within a police department and how a consultative, proactive management style can help solve and resolve them. Fully updated in this edition, its goal is to reveal how proactive management techniques and new technology are revolutionizing police management today.